A car drove through a home in Halifax last week shattering glass and wallboard and bursting water pipes while the home-owners were getting ready for bed upstairs. 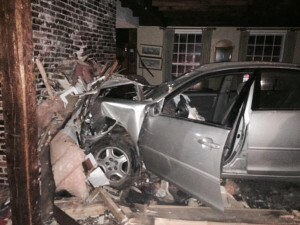 The historic Elm Street home built in the 1700s is uninhabitable now as the owners pick up the pieces from the accident, which occurred just after 11 p.m. Friday, July 2. The driver who was not identified by authorities is an 18-year-old local male who was transported to Brockton Hospital with non-life threatening injuries, according to a Halifax police media statement. There was extensive damage to the home said Halifax Fire Chief Jason Viveiros. When the vehicle broke through the wall, damages included ripped water pipelines with running water flooding an area on the first floor before firefighters could secure the source. The central supports of the home were the eight foot wide fireplace on the first and second floors. Usually at the end of the day the owner is relaxing on the couch in the same room but had gone upstairs with his wife several minute prior to the crash. “The family is very lucky to escape uninjured,” said Viveiros. The car failed to stop at the Pond and Elm street intersection before hitting the home. The building inspector was called to the home resulting in boarding up the exterior; power and water were shut down temporarily until repairs can be made. Motor vehicle charges are pending and the accident is under investigation by the Halifax police.